The creator of the viral hit 'Empathy Cards' teams up with a compassion expert to produce a guide to help you increase your emotional intelligence and learn how to offer comfort and support when someone you know is in pain. When someone you know is hurting, you want to let her know that you care. But many people don’t know what words to use—or are afraid of saying or doing the wrong thing. 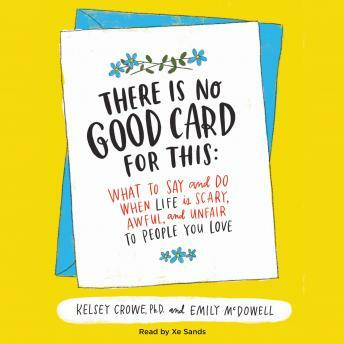 This thoughtful, instructive guide, from empathy expert Dr. Kelsey Crowe and greeting card maverick Emily McDowell, blends well-researched, actionable advice with the no-nonsense humor of McDowell's immensely popular Empathy Cards, to help you feel confident in connecting with anyone experiencing grief, loss, illness, or any other difficult situation. Written in a how-to, relatable, we’ve-all-been-that-deer-in-the-headlights kind of way, There Is No Good Card for This isn’t a spiritual treatise on how to make you a better person or a scientific argument about why compassion matters. It is a guide to effective compassion that takes you, step by step by step, past the paralysis of thinking about someone in a difficult time to actually doing something (or nothing) with good judgment instead of fear. There Is No Good Card for This features workbook exercises, sample dialogs, and real-life examples from Dr. Crowe’s research, including her popular 'Empathy Bootcamps' that give people tools for building relationships when it really counts. Whether it’s a coworker whose mother has died, a neighbor whose husband has been in a car accident, or a friend who is seriously ill, There Is No Good Card for This teaches you how to be the best friend you can be to someone in need.